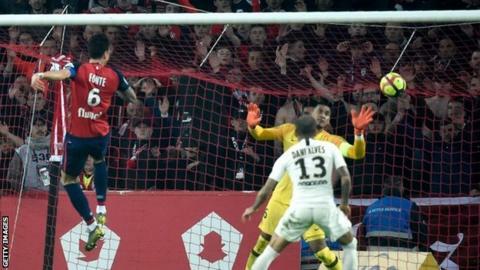 Thomas Meunier's own goal put Lille ahead but Juan Bernat levelled - before being sent off for a professional foul on Nicolas Pepe after 36 minutes. This was the first time PSG had conceded five in a league game since 2 December 2000, when they lost 5-1 at Sedan in what was then called Division 1. PSG had been expected to win the league last weekend, but drew 2-2 with Strasbourg in a game that will be remembered for Eric Maxim Choupo-Moting missing an open goal. Thomas Tuchel's Double-chasing side have a third chance to seal the title on Wednesday, needing a win at Nantes to seal a fifth French championship in the past six seasons.